You know that an event hosted for eleven years in a row, and by Bon Appetit Magazine, can be nothing short of extraordinary. 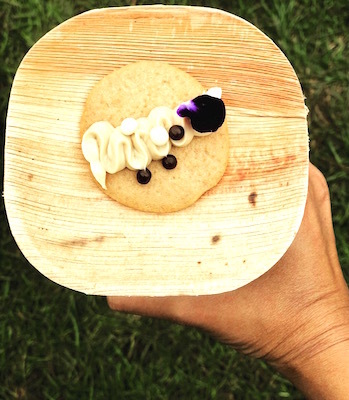 Considered the city and nation’s premier culinary event, and also known as my favorite weekend of the year, Chicago Gourmet was a haven of culinary delights this year. Keeping its promise, the event hosted the best of the best; all-star chefs, restaurants, sommeliers and mixologists all gathered in Millennium Park to show you what they got. As usual, I ate and drank my way through the event keeping in line with this year’s theme, Rock The Fork. The crowd seemed to have multiplied this year which is only a testament to the event’s soaring popularity. The Seafood Pavilion as usual boasted the longest lines, with them having ran out of lobster even before the first half of the day. I can’t help but feel utter pescetarian pride when I see attendees choose fish first. My favorites from that tent were the Octopus Tacos from Octavia Kitchen, the Oshinko Maki from Kamehachi and the Clam Chowder by Two Lights Chicago. In my humble opinion, these were bites you just couldn’t afford to miss. A special mention to the Smoked Trout with pickled chiles and tlayuda from Dos Urban Cantina! I liked seeing a whole tent cleverly named, Turnip The Volume, dedicated solely to vegetarians, because I am a vegetarian after all (that is, when the fish is missing). There, the Rojak Tofu from Imperial Lamian, was the showstopper. What amazing and unique flavors! I found myself hydrating more than once with the Indian Summer cocktail with Appleton and Allspice at the Venetian Las Vegas tent. Yes, I chose that over water and it was an easy decision. Several deserts to cool your palette with at Chi Gourmet this year, especially that Miso Caramel Tart by Floriole and donuts by Do-Rite, which ran out fast. Imagine an entire donut wall emptied by attendees. Build it and they will come, they say. 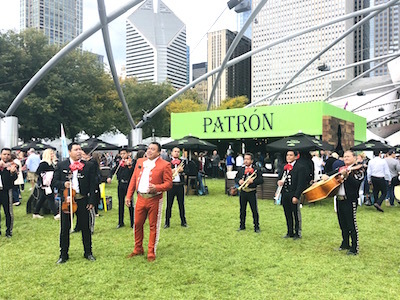 Some fun performances and a live Mariachi band by the Patron tent which kept the energy pulsating. I got to expand my love for wine with a delicious Butter Chardonnay, and a smooth cabernet from Justin Vineyards and Winery. The Chana Masala from Gaylord Indian Cuisine kept me warm and comforted as temperatures dropped throughout the day, and I went back for seconds and thirds. The Beet and Goat Cheese Tart and the Vegetarian Arancini at the Mariano’s tent were phenomenal little bites that got addictive fast. Too many other favorites to list, but suffice to say that Chicago Gourmet was a food paradise this year. And just a great day spent with fellow food bloggers and friends, plus an opportunity to say hello to some of my favorite chefs in Chicago. The after-party was a thing of its own. Global StREATS was held at the rooftop of the Harris Theatre next door. Lots of globally inspired cuisines featured by a great line-up of restaurants and chefs personally serving up the treats. Good food always makes you forget how full you are, right? A day of drinking and eating did nothing to stop me from indulging in Street Corn (my favorite) from Barrio, Pani Puri by Chef Andrew Zimmerman at the Proxi Chicago table, and a decadent Mexican Hot Chocolate cookie from Warm Belly Bakery. Those were just the highlights for me because there was tons more. The music and drinks kept flowing, with an amazing Moana performance at one point in the evening kept the crowd wanting more. I didn’t want the night to end, but definitely took a moment to look up at the beautiful Chicago skyline and give thanks for being able to live in one of the most delicious cities in the world. Until next year Chicago Gourmet, Au Revoir!